According to the beauty encyclopedia in my head, serums are lightweight, gel-like substances packed with highly active ingredients designed to address particular skin issues. The feel of TATCHA’s Luminous Deep Hydration Firming Serum fits the encyclopedia definition above, with a perfect, non-sticky, gel consistency that’s featherlight and quick-drying, making it easy to layer your creams or plant oils atop if you so choose. All of the active ingredients, though, are up for debate. TATCHA describes its Luminous Deep Hydration Firming Serum as a deeply hydrating blend of Okinawa red algae and hyaluronic acid designed to nourish skin that needs a shot of moisture and a bit of glow. 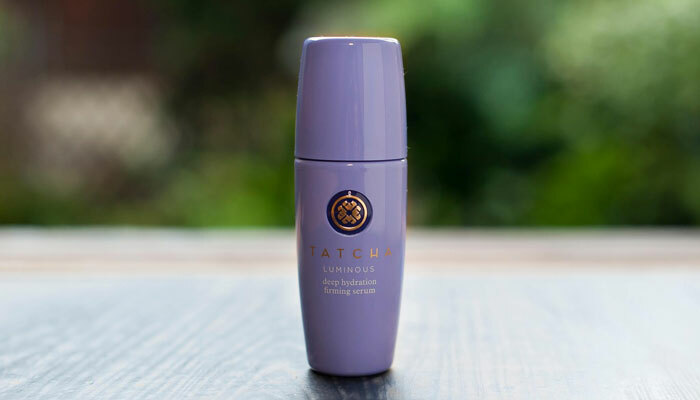 In true TATCHA fashion, this serum is packed with 23-karat gold flecks that gives skin a lit-from-within look without adding heavy shimmer or glitter to the face. You can see the light flecks and shimmer in the photo below. I enjoy using TATCHA’s Luminous Deep Hydration Firming Serum as a base layer in my skincare (after washing and toning) and then layering on oils and creams if necessary. If you have oily skin like me, you will find that this serum slicks on very easily and dries almost instantly. It won’t goo up the way some sticky serums do, and you can easily blend it with your favorite facial oils if you don’t want apply layer by layer of beauty products. It just takes one pump to cover the whole face. Try one and a half pumps to include your neck. If you’re able to, TATCHA’s Luminous Deep Hydration Firming Serum is an absolute gem to blend with the brand’s Gold Camellia Beauty Oil. Can you just imagine the gold glow you will have with these two products combined?! It also blends well with other beautiful, lightweight oils, and the scent is somewhat neutral so it won’t compete. It smells a bit like rice and a flower petal, but isn’t exactly floral. It’s just a very baby-soft scent. As part of the “Water” collection, TATCHA Luminous Deep Hydration Firming Serum harnesses the power of Okinawan red algae and hyaluronic acid to soothe and firm skin while injecting moisture. TATCHA also takes advantage of green beauty favorites such as silk extract, olive squalene, camellia extract and royal jelly extract, all known for their ability to soften and soothe skin. My concern with this product, though, is that a lot of that good stuff is further down on the ingredients list. I will be the first to note that the ingredients list looks intimidating, but a quick run through the EWG Skin Deep Database reveals that most of these ingredients score in the 0-2 range, with the exception of phenoxyethanol (4), which a lot of you avoid anyway. And, as you can see, TATCHA is formulated without parabens, mineral oils, synthetic fragrances, sulfate detergents, urea, DEA, TEA or phthalates. I’ve mentioned this in previous reviews of products that contain it, but the inclusion of alcohol (ingredient No. 5) is what gives me the most pause, as it’s known to be very drying to the skin — and the inclusion of it is higher up on the list. 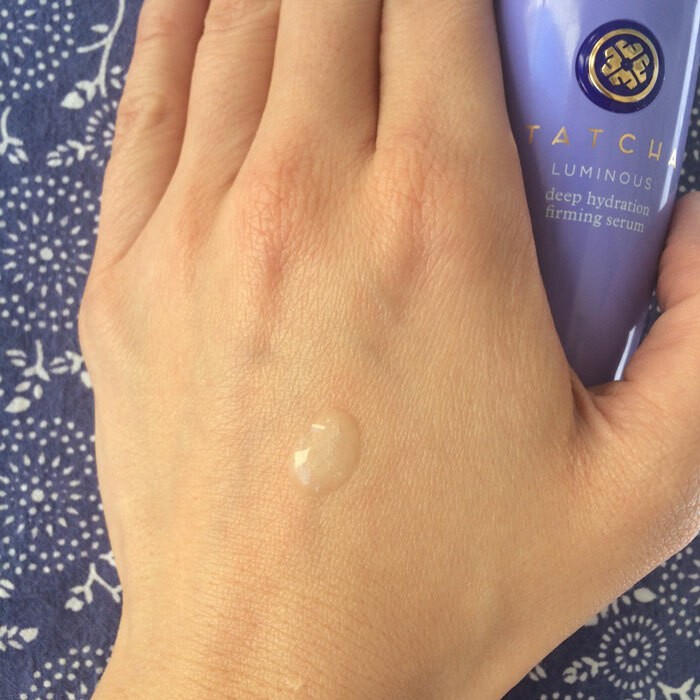 With that said, my skin has never felt tight, itchy or dry using TATCHA Luminous Deep Hydration Firming Serum. It’s the long-term effects of using alcohol-laden skincare that’s always up for discussion. I would love to hear more from you (and from TATCHA!) about the reasoning behind using and/or avoiding alcohol in your beauty routines. Is it absolutely necessary when it comes to formulating? What are the alternatives? Because of these hesitations, TATCHA Luminous Deep Hydration Firming Serum isn’t on my repurchase list. I’ll definitely be watching this brand to see how it develops even more and if any reformulation is in the works. You can also check out more of my TATCHA reviews here. In the meantime, I invite you to tell me more about alcohol in skincare and active ingredients in skincare. What are your totally off-limits ingredients? What’s your POV on alcohol in serums and other skincare treatment products? Tell me in the comments section!